This is not your regular shrine. The deity who stands leaning on a walking stick with the tricolour beside him is not drawn from Hindu mythology. But the setting and rituals are no less different from any regular temple. How can it be when for scores of people at Salangapalayam about 25km from Erode, Bapu is no less than God? On Gandhi Jayanti, there is a stream of people from neighbouring villages to the Mahatma Gandhi koil (temple) as it is locally known. They stand outside the sanctum sanctorum before a granite idol of Bapu, heads bowed and hands folded. The priest performs the aarti as part of the daily puja for Bapu. Across the Gandhi idol, stands a small bust of Kasturba. “I prayed to Bapu to make me a good girl and also help me to come first in my class,” says M Sanghvi, a class 4 student of Appachimar Madam Government School. Apart from numerous children from nearby schools, elders and senior citizens also visit the temple on special occasions like Gandhi Jayanti on Tuesday. “Generally, we have two pujas for Bapu everyday. On special days like today and on Independence Day and Republic Day we have elaborate rituals like smearing sandal paste, milk and panchaamritham abhishekam,” says V Kannan Iyer, chief priest of the temple. The temple was built in 1997. Vaiyyapuri Mudaliar, a local businessman and a Gandhian, was instrumental in constructing the temple which is now managed by a trust. “I personally consider Mahatma a divine person who was instrumental in changing the lives of many others. His sense of sacrifice and humility cannot be followed by ordinary people,” says Mudaliar. M Kuppulakshmi, a teacher of nearby government high school, says she makes it a point to ask her students to pray at the temple. In sharp contrast, and almost as an insult to the memory of Gandhi, entry to the Mariamman temple that stands across the Gandhi koil is restricted to upper castes. “Everybody is welcome inside Bapu’s temple. But there are some restrictions on the entry of dalits in the Mariamman temple,” says S P Annamalai, former panchayat president Salangapalayam. Surely, Gandhi, who campaigned all his life would have protested at this discrimination. 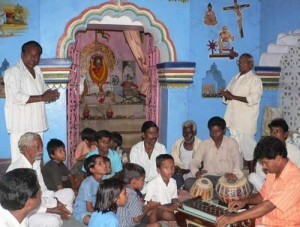 The most famous Gandhi temple is in Bhatra, a village near Sambalpur in Orissa. This temple built in the 1970s has a dalit priest and reportedly attracts devotees from Orissa and the neighbouring state of Chattisgarh. Interestingly, Mahatma Gandhi didn’t believe in idol worship though he has said he understood the spirit behind it.